Objective: To evaluate the effects on suicidal behaviour of legislation limiting the size of packs of paracetamol and salicylates sold over the counter. Setting: UK population, with detailed monitoring of data from five liver units and seven general hospitals, between September 1996 and September 1999.
subjects: People who died by suicidal or accidental overdose with paracetamol or salicylates, or who died of undetermined causes; patients admitted to liver units with hepatic paracetamol poisoning; patients presenting to general hospitals with self poisoning after taking paracetamol or salicylates. Main outcome measures: Mortality from paracetamol or salicylate overdose; numbers of patients referred to liver units or listed for liver transplant; numbers of transplantations; numbers of overdoses and tablets taken; blood concentrations of the drugs; prothrombin times; sales to pharmacies and other outlets of paracetamol and salicylates. Results: Numbers of tablets per pack of paracetamol and salicylates decreased markedly in the year after the change in legislation on 16 September 1998. The annual number of deaths from paracetamol poisoning decreased by 21% (95% confidence interval 5% to 34%) and the number from salicylates decreased by 48% (11% to 70%). 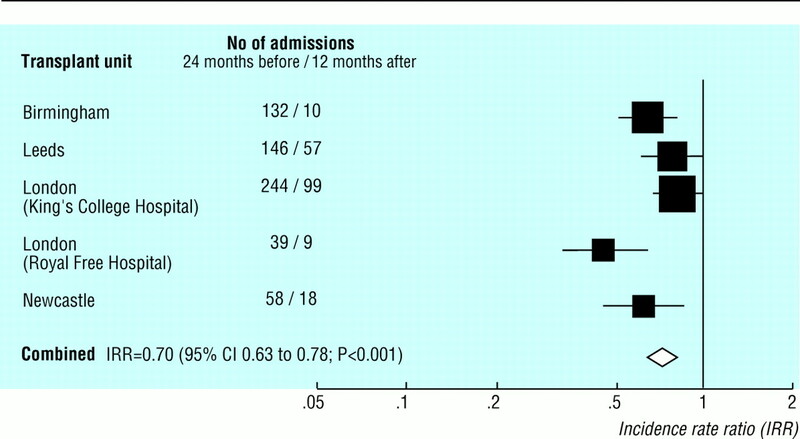 Liver transplant rates after paracetamol poisoning decreased by 66% (55% to 74%). The rate of non-fatal self poisoning with paracetamol in any form decreased by 11% (5% to 16%), mainly because of a 15% (8% to 21%) reduction in overdoses of paracetamol in non-compound form. The average number of tablets taken in paracetamol overdoses decreased by 7% (0% to 12%), and the proportion involving >32 tablets decreased by 17% (4% to 28%). The average number of tablets taken in salicylate overdoses did not decrease, but 34% fewer (2% to 56%) salicylate overdoses involved >32 tablets. After the legislation mean blood concentrations of salicylates after overdose decreased, as did prothrombin times; mean blood concentrations of paracetamol did not change. Conclusion: Legislation restricting pack sizes of paracetamol and salicylates in the United Kingdom has had substantial beneficial effects on mortality and morbidity associated with self poisoning using these drugs. We conducted a prospective study to assess the impact of this legislation on mortality from paracetamol and salicylate overdose; cases of liver poisoning after paracetamol overdose, as reflected in numbers of liver transplantations, referrals to liver units, and abnormal liver function tests; number and nature of cases of paracetamol and salicylate overdose; and sales of paracetamol and salicylates. The Office for National Statistics supplied data on drug related deaths (suicides and accidental self poisoning) and deaths from undetermined cause in England and Wales for September 1996 to September 1999. We included deaths from undetermined cause and accidental poisonings because using suicide verdicts alone to assess overall mortality from suicide is problematic.10 We extracted data on deaths of people aged 12 years and over where paracetamol or salicylates were recorded as the only drug involved. We also examined data on deaths where paracetamol or salicylates were part of a compound (excluding co-proxamol) or were taken with another, separate, drug. Data for 1999 are provisional, as some cases are still under coroner's review. The data from 1996 to 1998 indicated that records for 4.5% of cases were likely to be missing. Data on numbers of admissions after paracetamol overdose, patients listed for liver transplantation, and patients receiving transplants were supplied by five liver units in England for October 1996 to September 1999. In most of these units data were obtained from review of routinely kept clinical records. Data were collected in Oxford (one hospital), Bristol and Bath (four hospitals), and Manchester (two hospitals) on all presentations with self poisoning between 16 September 1997 and 15 September 1999. Figures for self poisoning with paracetamol, paracetamol compounds (excluding co-proxamol), salicylates, salicylate compounds, and other drugs were extracted. Information was not available for Manchester for all salicylate overdoses. The number of tablets taken in each overdose was recorded; where the number was imprecise we used standard approximations (details available from authors). In all three centres data were collected on blood paracetamol concentrations and prothrombin times for all paracetamol overdoses where such investigations were requested. Oxford and Bristol also collected data on salicylate concentrations. Where several concentrations were obtained for a patient, we recorded the highest value. Intercontinental Medical Statistics supplied data for September 1996 to September 1999 on monthly sales of paracetamol and salicylate preparations to pharmacies and other outlets in the United Kingdom. These data cover 97% of sales to pharmacies, including Boots (but excluding its brand name products). Because manufacturers were given 12 months' notification of the legislation, sales in the 12 months after the new legislation were compared with those in the penultimate 12 months before legislation. We included only sales of packs of fewer than 100 tablets as we could not determine the proportion of large packs sold on prescription. Rates of death, non-fatal self poisoning, admission to liver units, listing for liver transplantation, and transplantation were calculated separately for periods of 12 months before and after the new legislation. Exact confidence intervals for these rates were computed using the Poisson distribution. Relative incidence rates are ratios of the rate after the new legislation to the rate before legislation and are expressed as percentage increases or decreases. The data on mortality for January to September 1999 are provisional, as data on some cases still under coroner's review are missing. Similar data from 1996 to 1998 indicate that the number of cases with missing data in this period is likely to be 4.5% of the figures available to us. An adjustment of 4.5% was therefore made to the number of deaths after legislation. The proportions of deaths and non-fatal self poisonings attributed to each drug (and to combinations of drugs) before and after the legislation were compared as risk ratios, the changes being expressed as percentage increases or decreases. Confidence intervals and levels of statistical significance were computed using Poisson regression. The biochemical data and numbers of tablets taken in each overdose were positively skewed and were summarised using geometric means. Changes were expressed as percentage increases or decreases, their significance being estimated from t tests of log-transformed data. We analysed sales data using t tests without transformation. Data on transplantations, non-fatal self poisonings, and biochemical concentrations were stratified according to centre (Oxford, Bristol and Bath, and Manchester) and analysed using inverse variance and Mantel-Haenszel methods. A correction of 0.5 was added to zero counts. All analyses were undertaken using STATA version 6 (StataCorp, College Station, TX). After the introduction of the new law the proportion of all relevant drug related deaths that were attributable to paracetamol or salicylates on their own decreased significantly (table 1). Compared with the annual rate in the two years before the change, in the next 12 months there were 40 fewer deaths from paracetamol poisoning and 15 fewer from salicylates (after adjustment for missing data). Annual numbers of deaths in which paracetamol or salicylates were taken in combination with other drugs (which may have caused the death) and of deaths in which both paracetamol and salicylates were taken did not change significantly. After the legislation the annual number of admissions with hepatic paracetamol poisoning to liver units declined by 30% (95% confidence interval 22% to 37%) compared with the two years before the legislation. Significant reductions occurred in all five units (data for one centre have already been published).11 Across the five units the annual number of admissions decreased from 310 in the 24 months before the change to 193 in the 12 months after. Four liver units provided data on listings for liver transplantation. The total number of listings for all these units in the 12 months after the legislation more than halved compared with the annual number for the 24 months before the legislation, and in two of the units the numbers were significantly reduced (fig 2). 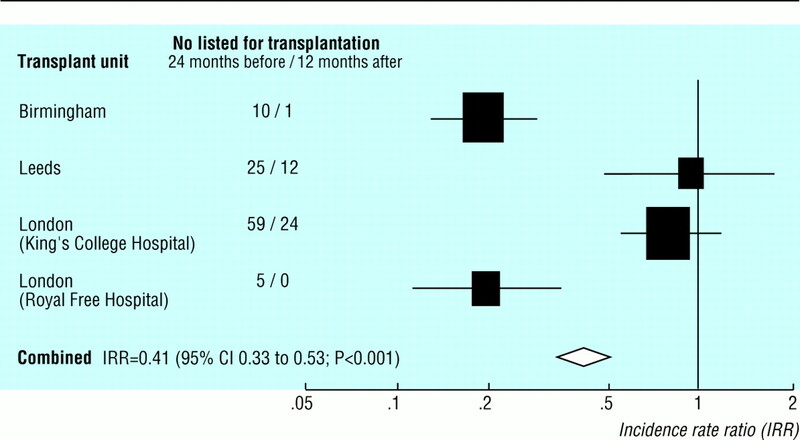 After the legislation 66% fewer patients (55% to 74%) in the five units underwent liver transplantation because of paracetamol poisoning of the liver, compared with the annual number for the two years before the change (fig 3). 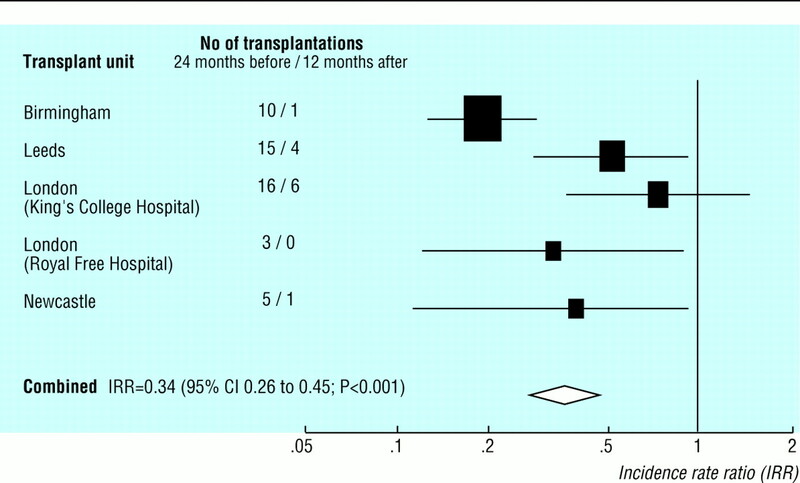 The reduction in four of the five units was significant: average annual transplantation rates decreased from 25 to 12 per year. Table 2 shows the number of presentations to seven general hospitals in Bristol and Bath, Oxford, and Manchester after self poisoning with paracetamol or salicylates in the 12 months before and after the legislation. Although overdoses involving paracetamol of any kind as a proportion of the total number of cases of self poisoning did not change, the absolute number decreased significantly by 11% (5% to 16%). The proportion of cases in which paracetamol alone was used (the most common type of paracetamol overdose) also decreased significantly (data available for Oxford and Bristol and Bath only). The proportion of overdoses involving paracetamol compounds increased significantly only in Bristol and Bath. Numbers of overdoses involving salicylates, whether alone or in compounds, did not change significantly. Table 2 also shows the numbers of overdoses in which paracetamol or salicylates were taken with other drugs. After the legislation there was a small but significant increase in the proportion in which paracetamol was involved with other drugs, but no significant change in the absolute number. Numbers of cases in which salicylates were taken with other drugs did not change. The mean number of tablets taken per paracetamol overdose (data for Oxford and Bristol and Bath) decreased slightly in the 12 months after the legislation compared with the previous 12 months, but the decrease was significant only in Bristol and Bath (table 3). The proportion of overdoses in which more than 32 tablets were taken, whether paracetamol or salicylates, decreased significantly. The numbers of tablets taken in overdoses of paracetamol compounds, salicylates, or salicylate compounds all decreased, though not significantly. The mean highest blood paracetamol concentrations recorded in Oxford, Bristol and Bath, and Manchester did not change after the legislation, but the mean highest prothrombin times decreased slightly (−2% (0% to −4%)). The mean highest salicylate concentrations recorded in Oxford and Bristol also decreased (−17% (−11% to −21%)). The mean numbers of tablets per pack of paracetamol and salicylates sold to pharmacies in the United Kingdom decreased markedly in the 12 months after the legislation compared with the penultimate 12 months before. There was, however, a compensatory increase in the number of packs sold of paracetamol, such that the total number of tablets of paracetamol sold did not change (table 4). The total numbers of tablets of paracetamol compounds, salicylates, and salicylate compounds sold to pharmacies decreased significantly. The numbers of tablets sold of preparations combining both paracetamol and salicylates did not change significantly. The legislation introduced in September 1998 to reduce the maximum number of tablets in packs of paracetamol and salicylates and to ensure the inclusion of stronger warnings of the danger of taking too many tablets was followed by significant reductions in mortality and morbidity resulting from self poisoning with these drugs. Although interpreting results from a study with a simple before and after design is problematic,12 the evidence for a causal relation between the legislation and the changes in mortality and morbidity is strong, especially because the decrease in the number of cases of self poisoning with paracetamol alone and in the resulting mortality came after several years of successively increasing numbers of paracetamol overdoses and related deaths.1 2 13 The effects of the legislation on mortality, numbers of cases of self poisoning, morbidity, and drug sales were consistent for both paracetamol and salicylates. It is important to consider the possibility of incomplete or inconsistently recorded data when interpreting the results of before and after studies. We made an adjustment to account for the incompleteness of mortality data for 1999. However, the degree of undercounting was small and had been consistent over the three previous years. Our investigation of trends in self poisoning was based on routinely collected data from seven hospitals. Although clinicians in these centres were aware of the introduction of the legislation, there is no reason to believe that this would have affected their recording of routine clinical information. Another potential limitation of before and after studies is the difficulty of accounting for underlying trends in the outcomes; analysis based on proportional incidence counters this. We are not aware of any changes in policy on blood testing in cases of overdose during the study period. One liver unit did not provide data for inclusion in the analyses, but there is no reason to expect that the pattern in this centre would have been any different from that in the other centres. Packs of 100 or more tablets were omitted from the analyses of sales as we were unable to determine what proportion of these were sold over the counter as opposed to being provided on prescription. Since the new legislation, nearly all packs of this size would be supplied only on prescription, which suggests that our estimated changes are underestimates. The number of deaths from self poisoning with paracetamol alone went down by 40 from the 12 months before the law change to the 12 months after, and the corresponding figure for salicylates was about 15. The reduction in mortality from paracetamol self poisoning was reflected in reduced morbidity. The reduction in the number of admissions to liver units because of paracetamol poisoning has already been highlighted.11 Our analysis of data from five liver units shows that there was an even greater reduction in the number of these admissions that progressed to liver transplantation. A reduction in the frequency and severity of paracetamol self poisoning after the legislation has been reported in a London hospital.15 We also noted a reduction in the number of large overdoses of salicylates and in maximum blood salicylate concentrations. Trends in the nature and number of paracetamol and salicylate overdoses and their consequences are compatible with sales data, which showed a marked reduction in the mean number of tablets per pack sold to pharmacies and some other outlets for all relevant preparations in the 12 months after the new legislation compared with the penultimate 12 months before. Although increases in the number of packs sold of paracetamol and paracetamol-salicylate compounds seemed to compensate for these decreases, the net effect would have been a reduction in the maximum number of tablets in households. The sales data cover most but not all relevant products and would reflect sales over the counter. Since the new legislation, pharmacies and other retail outlets have usually allowed only one pack to be bought per transaction. Although this does not prevent a customer visiting several outlets to amass a large supply of the drugs, the general effect of the legislation is to reduce the maximum number of analgesic tablets available for impulsive self poisoning. An even smaller maximum pack size for pharmacy sales, such as the 8 g limit in France, might have had a greater impact still. Further monitoring is needed to see if the gains persist and to detect any signs of substitution of other possibly more dangerous drugs in cases of self poisoning. We thank Sue Kelly, Olivia Christophersen, and Alan Baker (Office for National Statistics); Claire Cuff (Intercontinental Medical Statistics); John McVittie (clinical biochemistry, John Radcliffe Hospital, Oxford); Sue Mulholland (Centre for Suicide Research, Oxford University); the staff of the department of psychological medicine, John Radcliffe Hospital; Paul Thomas and James Osborn (chemical pathology, Bristol Royal Infirmary); Ann Fisher (haematology, Wythenshawe Hospital, Manchester); Tony Cummings (biochemistry, Manchester Royal Infirmary); Julia Wendon (liver unit, King's College Hospital, London); Andrew Burroughs (liver unit, Royal Free Hospital, London); James Neuberger and Damian Dowling (liver unit, Queen Elizabeth Hospital, Birmingham); Mervyn Davies and Helen Aldersley (liver unit, St James's Hospital, Leeds); Oliver James, Martin Prince, and Mark Hudson (liver unit, Freeman Hospital, Newcastle). Contributors: KH initiated the study and contributed to the design, interpretation, and reporting. ET coordinated the collection of the data and contributed to the study design, interpretation, and reporting. JD conducted the statistical analyses and contributed to the interpretation and reporting. LA and DG contributed to the design of the study, data collection, interpretation, and reporting. JC and OB contributed to database design, data collection, and reporting. KH is guarantor for the study. Funding South East Region NHSE Research and Development. KH is also supported by Oxfordshire Mental Healthcare Trust.
. Trends in deliberate self-harm in Oxford, 1985-1995. Implications for clinical services and the prevention of suicide. Br J Psychiatry 1997; 171: 556–560.
. Changing patterns of self-poisoning in a UK health district. Q J Med 1996; 89: 893–901.
. Paracetamol overdoses—facts not misconceptions. Pharm J 1993; May 22: 706–707.
. Liver failure induced by paracetamol. BMJ 1993; 306: 157–158.
. Use of paracetamol for suicide and non-fatal poisoning in the UK and France: are restrictions on availability justified? J Epidemiol Community Health 1997; 51: 175–179.
. Acute liver failure. Medicine 1999; 27: 80–82.
. Paracetamol and aspirin. Curr Probl Pharmacovigilance 1997; 23: 9.
. Paracetamol self-poisoning. Characteristics, prevention and harm reduction. Br J Psychiatry 1996; 168: 43–48.
. Why patients choose paracetamol for self poisoning and their knowledge of its dangers. BMJ 1995; 310: 164.
. Trends in suicide deaths in England and Wales. Popul Trends 1992; 69: 10–16.
. Reduction in incidence of severe paracetamol poisoning. Lancet 2000; 355: 2047–2048.
. Prevention of paracetamol poisoning. Lancet 2000; 355: 2010–2011.
. Paracetamol related deaths in England and Wales, 1993-97. Health Statistics Q 2000; 7: 5–9.
. Serial prothrombin time as a prognostic indicator in paracetamol induced fulminant hepatic failure. BMJ 1990; 301: 964–966.
. Change in occurrence of paracetamol overdose in UK after introduction of blister packs. Lancet 2000; 355: 2048–2049.